T he squirrels got the cherries, the blackbirds scoffed the white currants, but we had a good haul of redcurrants from the garden this year. They usually end up made into jelly and the occasional summer pudding, but I thought it was time for a change. 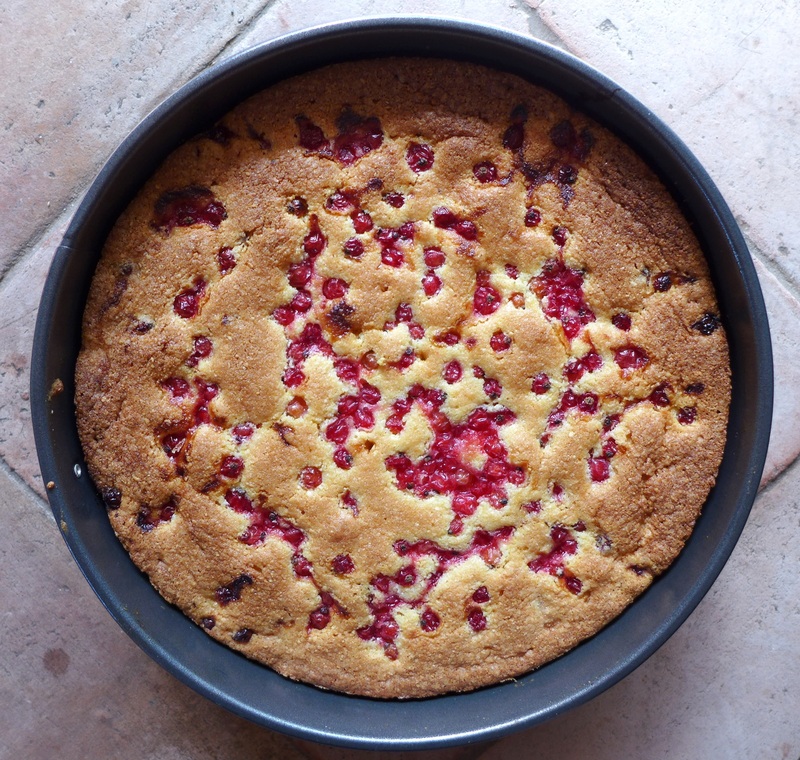 I tried a redcurrant clafoutis, an experiment doomed to failure as (with the honourable exception of a well-made Portuguese custard tart) I have never liked sweet egg custards. Turns out I still don’t. So I made this instead. It’s a moist, flourless cake, useful for those following a gluten-free diet but pretty tasty in anyone’s book. It’s not a fancy concoction – I am useless at icing and piping and actually I prefer simple cakes to those smothered in buttercream – but it makes a fine dessert along with a dollop of Greek yoghurt or whipped cream. Apologies for not showing the cake sliced; I left one at a friend’s house and fully intended to make another but ran out of time and certain vital ingredients. I’ll try to revisit this post soon and improve the picture content. Preheat the oven to 160C/320F/Gas Mark 3. Grease the inside of a 23cm loose-bottomed cake tin and line the base with baking parchment. In a large bowl, beat the butter with the sugar until smooth, pale and fluffy. In another bowl, mix together the polenta, almonds, salt and baking powder. Add a couple of spoons of the dried mix to the butter and sugar and beat it in. Crack in an egg and beat again. Repeat until all the eggs have been incorporated into the batter (alternating the eggs and dry mix helps stop the batter from splitting). Now beat in any remaining dry mix. 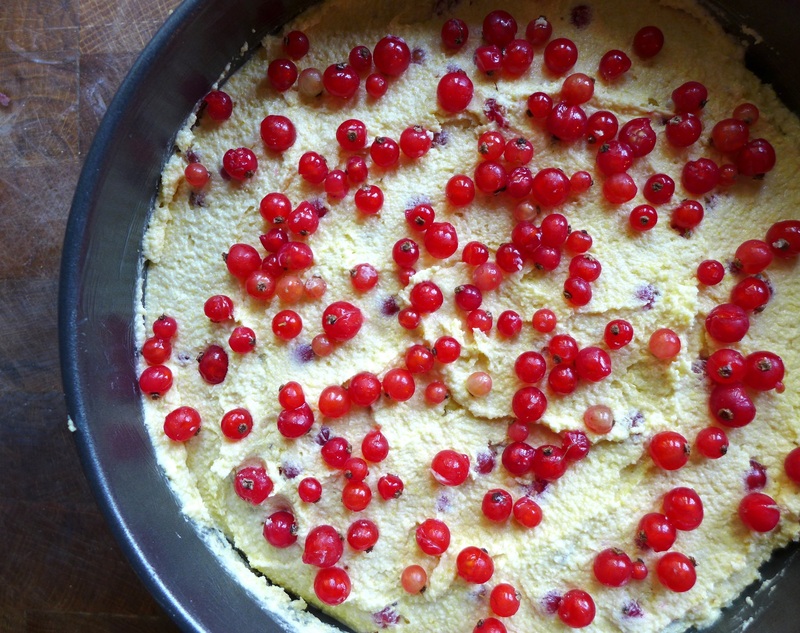 Gently mix in the orange zest and about three-quarters of the redcurrants. Spoon into the tin, smooth the top, then scatter over the remaining redcurrants. Bake for about an hour or until a skewer inserted into the centre comes out clean and the cake is shrinking away from the sides. Cool in the tin. Once cooled, remove from the tin and plate up, lightly dusted with icing sugar (if you like) and garnished with the reserved sprays of redcurrants. 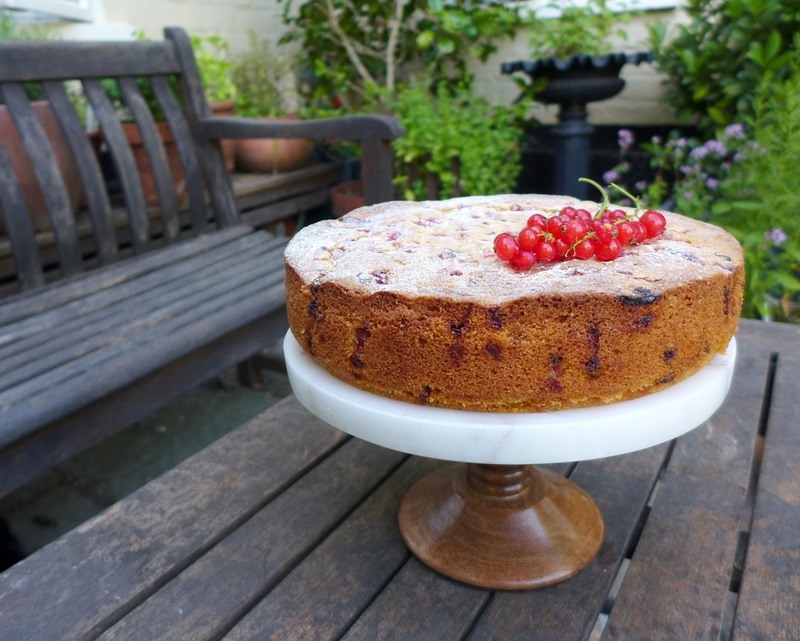 This entry was posted in Desserts, cakes and biscuits, Vegetarian and tagged GF cake, gluten free, redcurrant and almond cake, redcurrent almond and polenta cake, simple cakes, summer fruits by Linda Duffin. Bookmark the permalink. WoW ! The cake looks amazing ! That’s very kind, thank you! Have a great weekend. I couldn’t agree more, I’m really not a fan of trowelling on buttercream. I’m guessing redcurrants are imported in Oz, then? They are delicious in a summer pudding, for sure. It does look and sound lovely. Sadly red currents are almost impossible to find in these parts. Substitutes to suggest? Thanks, Frank. Perhaps blueberries might work, with lemon instead of orange zest? I think raspberries would be too wet. Regards, Linda. Really? No, I didn’t know that. What a shame you can’t source them, they have such a lovely, clean flavour. 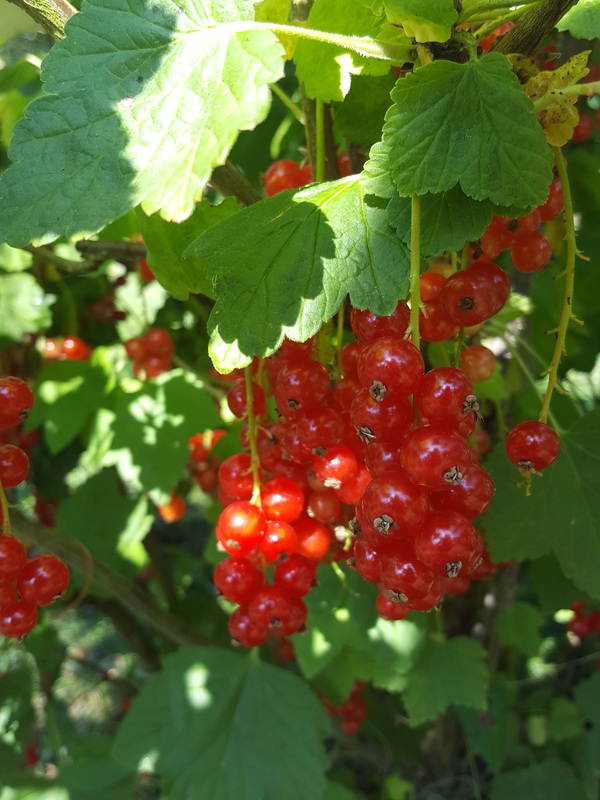 https://www.hobbyfarms.com/2-banned-berries-making-a-comeback-2/ I reckon my great-grandmother must’ve been a criminal, though, because she had a giant gooseberry bush when I was a kid!